Construction: Gold anodized aluminum chassis, CNC machined out of 6061 billet aluminum. Also available in stainless steel body on special request. Configuration: Stick style probe with "Ranger motion” or probe and cable. Lengths available up to 200 feet. 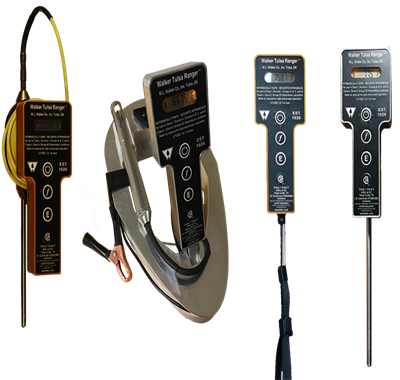 All probe styles available, please visit the following link to view our Probe Styles. Protection: All Tulsa Rangers come with a matching gold anodized latching aluminum storage box with silhouette cutout black hi-density foam liner. Price: $750.00 for Standard model with case. Inquire for price of units made with a probe and cable. Price $650.00 for Standard model (no case). Storage of temperatures Manual (can be recorded and averaged. This product is shipping now; to purchase please visit our Tulsa Ranger™ page. Please direct all inquires to Sales@wlwalker.com or (918) 583-3109.